HTC has just pulled the veil off the HTC Desire 500 in Taiwan, targeting younger adults. A Taiwan Mobile exclusive from August 1, the device has us a little perplexed over its price point of around $400 (NT$11,900). 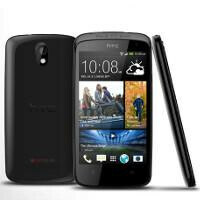 The smartphone has sank its teeth deep into the design cues of some of the latest HTC offerings. Namely, the HTC SV and HTC One S appear to have both contributed to the Desire 500's look. This time around, however, the metallic encasing is traded in for plastic. Regardless, there's no denying – the phone actually looks good. Unfortunately its specs sheet relative to its price tag leave much to be desired. A thoroughly unimpressive 4.3-inch 800x480 resolution display is powered by a quad-core Snapdragon 200 clocked at 1.2GHz. Aiding the CPU with the brain work is an Adreno 205 GPU and 1GB RAM. Only 4GB of internal memory is available, fortunately – a microSD slot is available. An 8MP BSI snapper is found on the back, with a 1.6MP BSI front-facing camera also in tow. The device is 9.9mm thick, weighs in at 123g and is powered by a 1800mAh battery. The HTC Desire 500 will come Beats Audio-equipped, along with an unspecified version of Android Jelly Bean running under HTC's proprietary Sense 5 skin and will also feature BlinkFeed. No BoomSound speakers are to be found. Whether HTC's latest offering will manage to carve a niche for itself remains to be seen. To be completely frank, however, we aren't holding our breaths – not at this price point. A pity, since HTC's financial troubles need some immediate attention, and moreover – a solution. The phone looks okay, but the button layout ruined it. Snapdragon 200 for $400 lol. This is definitely on the very low end of mid range if not "entry level". Ehh... I disagree. It definitely falls into the mid-range category. maybe you should look at 2013 midrange phones, not 2011 or 2012. 4GB internal memory pretty much sums this phone up. So the S4 mini as well then? I don't understand why you would even bring that into this. The S4 mini trumps this phone in almost every category. Higher resolution, faster processor, more RAM, bigger battery, etc. If you're gonna troll, at least try to sound semi-intelligent. S4 as a slower processor. dual core 1.7 VS quad core 1.2 for the Desire 500. If you'll argue with trolls, at least get your facts straight. My facts are right, idiot. If you really think the Snap 200 can outperform the Snap 400, you are truly on something. The number of cores is irrelevant. Go do some research & you will realize whose facts are straight. That phone will never see an update in its life. 480x800 instead of 540x960 on a screen really puzzles me as to why HTC would do that. PhoneARENA.. Please make a review comparison of the best mid-range smartphone out there.. S4 Mini, HTC ONE mini, lumia 720, Xperia SP or Xperia ZR, LG F7.. and also if you can inlcude Motorola Droid newest mid range.. that review is going to benefit alot of mid range consumers like me.. PLS.. Looking Forward..
You'll never get a response from PA staff unless you comment on an article Michael H. published. But good suggestion nonetheless. As I told SouljaBOY in the Verizon liveblog topic, a review almost -exactly- like this one is already on the site. Do a search for "the new midrange". htc one sv is better, and it comes with lte. im i the only one who notices that ugly huge bezel at the bottom? Die HTC die. Xperia SP is a better choice at this price point! with absurd pricing of their phones (for what you're getting) they'll probably be. Why do they cant putt a menu button ?? ?